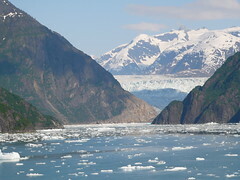 After seeing a distant view of the Mendellhall Glacier while Kayaking I felt content that I had seen one of the main features of North America that had given interest in doing this cruise. I never imagine that later today our cruise ship that is `10,000 times bigger than our kayak would sail right up to the Sawyer Glacier through ‘Tracey’s Arm’. An absolutely spectacular sight cruising through a fjord full of icebergs. Some the size of houses. It is quite humourus thinking about how many photos I took of that first iceber we saw, only to round an island and find the sea dotted with thousands of them. Some of the photos of the first iceberg are probably the best though as there was less things to draw your attention making it easier to focus. We saw several Harbour seals sunning themsleves on top of the ice bergs. Many of them with baby seal cubs. Still no whales that are worth mentioning though. As you can imagine it was a little cool outside. The water obviously only just above freezing and the wind, which was very strong, was like ice. Gemma lasted about 2 hours outside before retiring to the warmth of the observation lounge. I battled on for another half an hour until I had drained my second camera battery and my shutter finger was frozen. Many of the photos will require some post production editing that I can’t do until we get a laptop so I have uploaded a few of the ones that look ok as-is onto flikr and will put more up when I can manipulate them. I hope you can get a feel for the scenery we saw today but can’t strongly recommend enough how much better this is in person. Those who can, should definitely come and see this for themselves. On a sadder note, I lost my beanie this evening in the observatory lounge. No one has seen it so I think it has found its way into someone elses bag. I haven’t seen anyone with similar headwear so I’ll keep an eye out for anyone wearing it, but otherwise I’ll have to buy a new one in vancouver. Enjoyed your flickr shots after reading the BLOG entry Simmo. Nice ICe. Sad about the beanie – I guess one of the eighty year olds just couldn’t resist the quality of aussie wool and leapt out of their deckchair as soon as they saw the opportunity. Watch out your camera (and your wife).